All the best strikers are maniacally obsessed with scoring goals. Everyone knows about this single-mindedness, and yet it can still be a little jarring to hear just how deep this drive goes. Like this weekend, when Harry Kane made his case that he’d gotten a touch on a goal that had been credited to a teammate by swearing on the life of his young daughter. 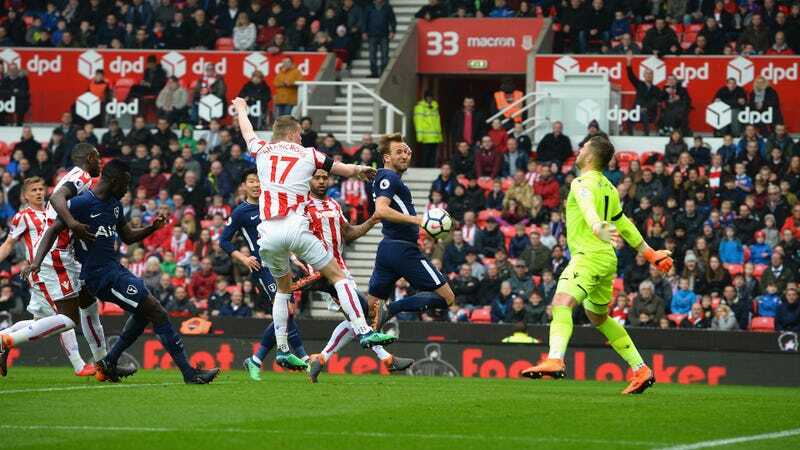 The goal in question was Tottenham’s second in Saturday’s match against Stoke City. From a free kick, Christian Eriksen sent in a cross that flew into the box, sailed right past (or maybe onto?) the head and shoulder of Kane, and then hit the back of the net. Kane celebrated the goal as if he’d gotten a touch, but the league’s official scorekeepers gave the goal to Eriksen. “Have they? I swear on my daughter’s life that I touched the ball, but there’s nothing I can do. If they turn it around, they turn it around. If they take my word, they take my word. Quite dramatic language there for something so seemingly meaningless! Kane’s motivation to claim the goal does make some sense. He’s a striker, and strikers love goals, plus he’s won the league’s Golden Boot award for being the highest scorer for two years running now and no doubt wants to best Liverpool’s Mohamed Salah this season for the threepeat. If can were awarded the Eriksen goal, it would put him on 25 for the year, four back of Salah’s 29. He reportedly doesn’t have a contract bonus for winning the Golden Boot, but pride is justification enough for wanting every goal you can muster—just maybe not when that pride involves putting up your child’s life as collateral. The video evidence above doesn’t seem conclusive one way or the other, which would have you believe the goal probably should’ve remained Eriksen’s. But when you factor in Kane’s testimony, it makes more sense that the appeal panel would reverse the original decision and give it to the striker. If Kane is willing to put the life of his own daughter on the line for a single stinking goal, there’s no telling what he’d do to three random panelists who denied him what he covets most. But hey, at least little Ivy Jane is safe now.